The Douglas Hyde Gallery’s current overarching theme in its exhibitions is the reconfiguration of familiar and everyday objects and actions in art. Their current exhibition, featuring Peter Gallo and Lois Weinberger, seems to perfectly encapsulate this. Walking into the open and minimalist exhibition space of the gallery, I was first confronted by Gallo’s works. The Vermont-based artist has studied and written on art history, leading to his eccentric yet thoroughly relatable style. Materials from everyday life serve as a canvas on which Gallo paints, draws, and writes. Gallo borrows sayings and words from his surrounding life, such as from his favourite musicians and authors. The mixture of these ‘borrowed’ words and materials and the use of classic painterly components, in particular oil paint, creates a confrontational message for the viewer. What are we really looking at, what does the artist mean by these combinations and juxtapositions, and what do these combinations instinctively mean to us, the viewer? While exploring the exhibition, I was struck not only by the overall unity of the exhibition pieces despite their variety in material and the dates they were created, but also by the familiarity of the objects in contrast to the intimacy of the pieces. Je Me Souviens, 2007, is an oil painting created on a book cover found by the artist. The roughness of the piece and the familiar words of ‘I Remember’, made foreign by the artist writing them not only in French, but also by painting the word backwards, creates an air of burden and unease, while at the same time evokes a feeling of honesty and truth within the work. The straightforward nature of Gallo’s works creates a harmony in the exhibition and in a sense the pieces’ simplicity add complexity to the overall show. The works are truly unimposing, in the most thoughtful and curious way. Lois Weinberger’s space, in contrast, is stark and unexpected; a divergence from Gallo’s warmer, privately reflective exhibition space. Weinberger’s Invasion (2002) is contemplating a bigger picture. It is reflecting on the transience of time, the collapse of life, nature’s continuous adaption and human beings’ place within this natural world. The room itself in which Invasion is held is a sculpture in itself. Forty-five different types of tree fungi are scattered throughout the room, in what looks like naturally occurring clusters. Setting oneself inside the room is an experience alone. It is at once unsettling and intriguing to look at nature set within the space and idea of the ‘white cube’, with only artificial lighting cast on these illusory fungi. The room feels almost like a form of interactive sculpture, as the body plays a key role in the meaning of the piece. Introducing yourself into this space is an unusual experience, especially if done so alone. 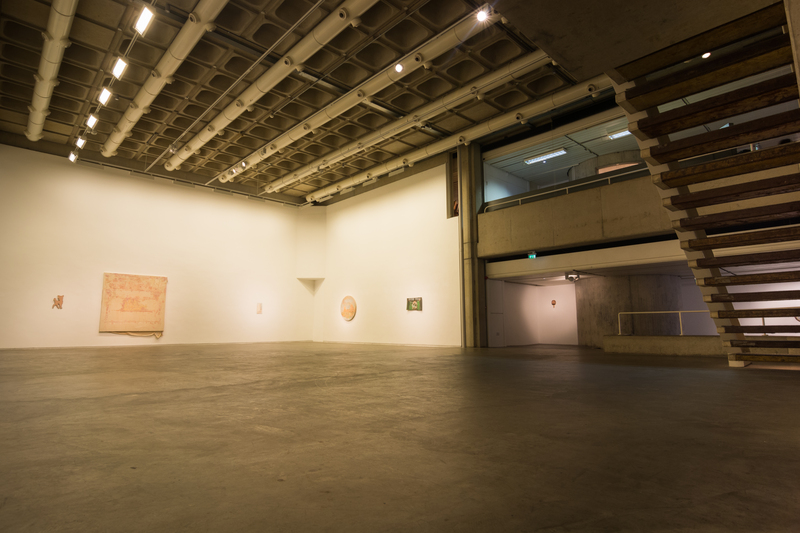 The Douglas Hyde Gallery is currently exhibiting work by Niamh O’Malley and Mairead O’hEocha until February 25 2015.